Pick a pork, then pick a side. Carolina barbecue has been the center of a longtime duel between Eastern style and the western Lexington style. East of the Triangle you’ll find vinegar-based barbecue sauce on your pulled pork, and from the Piedmont west you’ll encounter a sauce that’s still heavy in vinegar but with a sweetness and red hue from the addition of ketchup (among other ingredients). No matter which side of the dividing line you venture to, you can’t go wrong with pulled pork piled high with slaw, baked beans, and hush puppies on the side from any of NC’s old-school BBQ joints — or better yet, a good ol’ fashioned pig pickin’ where they slow roast a whole pig in someone’s backyard. Try Bridges Barbecue Lodge in Shelby, Backyard BBQ Pit in Durham, or High Cotton Barbeque in Kitty Hawk. With 366+ taps across two floors and a rooftop bar, Raleigh Beer Garden lets you explore the entire world of beer from a single seat. 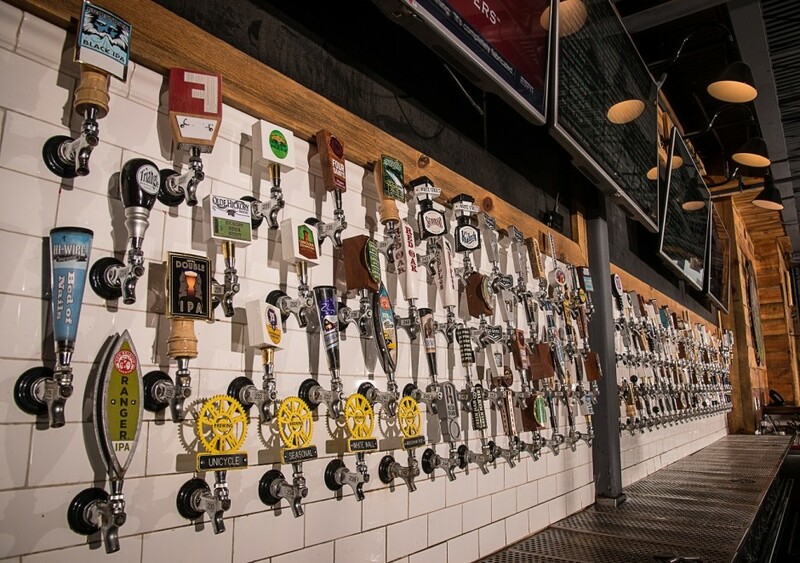 Start with North Carolina’s own exploding beer scene at the first floor bar, including Wicked Weed’s Freak of Nature, Foothills’ Jade IPA, Fullsteam’s Carver Sweet Potato Lager, and dozens more. On the second floor and rooftop, order other all-American or international brews like MOA’s Breakfast Beer, New Holland’s Dragon’s Milk, and Black Sheep’s Monty Python’s Holy Grail Ale. Pair your flight with a picnic table on the patio, a beer garden burger, and some live local bluegrass, and you’ll enjoy an evening full of North Carolina flavor. Kitty Hawk may be a small town, but it’s got big notoriety as being first in flight — no matter what that four-letter state to the northwest might have you believe. Here on the largest dunes on the East Coast at Jockey’s Ridge State Park, you can learn to fly just like the Wright Brothers did by taking to the air in hang gliding lessons with Kitty Hawk Kites. Soar off the dunes with a view over colorful beach homes to see the waves crashing in the distance, or simply stand atop the sand for a panoramic view from sound to sea. There are few places quite as beautiful as the Blue Ridge Parkway in the fall. Peak colors start in the higher elevations and work their way down through the season, but if you drive any stretch of varying elevation between Cumberland Knob and Cherokee around mid-to-late October, you’ll find fiery reds, rich oranges, and vivid yellows rolling across the ridges and valleys from every overlook. For some additional highlights along the way, visit the Linn Cove Viaduct (pictured above), Mt. Mitchell (tallest peak in the East), and Grandfather Mountain…which has another North Carolina exclusive further down this list. On February 1, 1960, four African-American students sat at the lunch counter in the F.W. Woolworth Co. in Greensboro, NC, with a quiet but resolute purpose. When they were asked to leave, they peacefully refused as a challenge to segregation, sparking the sit-in movement that spread rapidly across the South. These nonviolent protests led to desegregation in Woolworth’s and many other public places and fueled the Civil Rights Movement across the country. Today, travelers can explore the dark and tumultuous thread of American history from slavery to contemporary heroes and struggles through exhibits in the former Woolworth building, now the International Civil Rights Center and Museum, including that very same lunch counter, unmoved in 56 years. Cape Hatteras Lighthouse attracts more than 175,000 visitors annually, and for good reason: Hatteras Island’s nightlight is the tallest lighthouse in North America and the tallest brick lighthouse in the world — and still engineers moved the entire structure nearly 3,000 feet inland to protect it from an eroding coastline. Visit the structure in Buxton, NC, and climb the 257 steps to the top for a 360-degree view of Pamlico Sound and Cape Point, where the Gulf Stream veers out into the Atlantic. If climbing isn’t your speed, admire the 208-foot-tall black and white candy stripes from a picnic on the grassy lawn below, or spend a day on the beach at the nearby surfing spot known as “First Jetty,” with the lighthouse as your backdrop. The carnivorous plants might seem like the product of the farthest corners of the Amazon, but their native home is actually the southeast corner of North Carolina. Though the Venus flytrap has been successfully transplanted around the world, there’s nothing like seeing them up close (but hopefully not personal) in their original habitats. Visit nature areas around Wilmington for a glimpse, such as Green Swamp Preserve (also famous for its orchids) or Carolina Beach State Park. These fascinating plants can be elusive, so consider joining a ranger on one of the park’s guided Carnivorous Plant Hikes, where you can see not just the well-known spiny living traps but other “plants that bite back” too, like sundews and pitcher plants. Just be careful not to touch! Many people don’t realize just how far out into the Atlantic North Carolina’s Outer Banks barrier islands stretch. At multiple points along Highway 12, the two-lane road threading the island chain, the mainland is as far as 30 miles away. But that doesn’t mean there isn’t plenty to see and do along these remote sandbars. Where the pavement starts in Corolla, you can watch the sun rise over the ocean and see the area’s famous wild horses. South of Whalebone Junction, climb the Bodie Island Lighthouse, cross the Bonner Bridge to Pea Island National Wildlife Refuge, and meander through Hatteras Island’s colorful towns to the Cape Hatteras Lighthouse (see #6 above). Drive farther south still to where the pavement ends at the Graveyard of the Atlantic Museum, catch the ferry to Ocracoke for pirate history a la Blackbeard, and then watch a vivid sunset over Pamlico Sound — one of the few places on the East Coast where you can see the sun sink into the water. Food: Wander Dilworth and the Historic South End for trendy restaurant and food truck selections that rival those of big West Coast cities, from the soulfully Southern Tupelo Honey to the contemporary taco joint Bakersfield East. Beer: Head to the artsy NoDa (North Davidson) district for NoDa Brewing Company’s World Beer Cup-winning Hop Drop ‘n’ Roll or Heist Brewery’s experimental tapas-style pub food and beer pairings. History: Drive through the Myers Park area for a tour of quintessential Southern well-to-do charm. Nature: Visit Freedom Park for walking paths, sports facilities, and a seven-acre lake. Racing: Check out the NASCAR Hall of Fame. If Charlotte’s urban scene isn’t your style, the US National Whitewater Center has your outdoorsy side covered — choose from whitewater and flatwater courses, rock climbing walls, mountain biking, hiking, high ropes and ziplining, or try them all with an AllSport day pass. For a more laid back visit, pack a chair or a blanket, hit the beer garden, and pick a spot on the lawn for an outdoor summer concert. All that remains of the first colonial settlement in America is the word “Croatoan” carved into an abandoned structure and “CRO” carved into a tree. While archaeological digs may have only recently revealed the first viable clues to solving the mystery of the Roanoke Colony, the story has captivated researchers and imaginations for centuries. The little we do know about the country’s first settlers has been presented to audiences every summer since 1937 at the symphonic outdoor drama The Lost Colony, in Manteo’s Waterside Theater on Roanoke Island. There’s also a lesser-known dimension to the play: The state’s beloved Andy Griffith — of the classic The Andy Griffith Show, set in Mayberry, NC (based on real-life Mount Airy, NC) — acted in the play from 1947 to 1953 and ultimately moved to Manteo permanently and supported the production for years. Today, visitors can watch the long-running performance or check out character dinners, ghost tours, live concerts, and the PsychoPath at Halloween. Grandfather Mountain is the highest peak in the eastern Blue Ridge Mountains and a sprawling nature preserve with protected habitats for bears, birds, and many other native species. Views from the peak and of the peak itself have drawn visitors since the 1800s, when the only way for many to access the high elevations was on horseback. Over time, those horse trails evolved into walking trails and eventually a two-lane paved road in the 1950s. Soon after, the mountain’s famous Mile High Swinging Bridge was built across the 80-foot chasm to an overlook to make the views accessible to all. Today, the bridge is still the highest suspended footbridge in the world at 5,280 feet above sea level, its creaky swaying over dizzying heights an adrenaline rush for those brave enough to make the crossing. If you do, the view of the hazy blue mountains is more than worth the shaky steps. There’s a unique generational dividing line in NC, and which side of the line you fall on can reliably be determined by how you know Lake Lure. If it holds a fond place in your memories as the site of your favorite summer camps growing up, chances are you were born in the ’80s or later. But if you were in your teens or older in 1987 when Dirty Dancing debuted, you probably recognize Lake Lure as the setting of the iconic “lake lift” scene. The lake is open from Memorial Day to Labor Day, so grab a (strong) partner, wade out into the water, and have the time of your life. You’ll have to plan ahead, though — the beach is one of the most popular landmarks in town, especially during the Dirty Dancing Festival, so get your beach tickets and claim your spot early so as to have time for plenty of practice (and hilarious pictures).